It’s easy to get wrapped up in the workday and lose sight of continuing to work on yourself while you’re stuck behind a desk, but does it really have to be that way? With so many options these days for decorating our own space at work along with ways we can continue to focus on ourselves even while doing our day jobs, it’s never been easier to make our entire lives a beautiful display and collection of great opportunities for personal growth and awareness. But how can we really connect with our mind body and soul in the workplace? Here are some great ways we can create the best lives possible. Here are a couple of ideas on how you can create a better working environment and do an #OfficeMOT on your workspace. Staying positive at work can be difficult – with so many demands on our time, energy, attention and more it can seem like a never ending whirlwind of “do this, do that” and more. 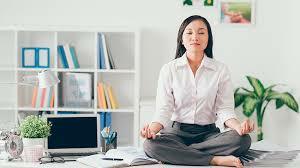 By taking some time out from our keyboards and screens and doing breathing techniques or even some light yoga at our desk or in our cubicle we can help to realign and recentre ourselves and provide us a much needed boost to power through the rest of the day. Breathing deeply and holding the breath can be hugely beneficial to clearing the mind and helping to recenter yourself when you feel out of balance, pulled in all directions and depleted of mental energy. Yoga in the office can easily be helped with furniture such as desks and chairs like those from Furniture At Work, and you can even use the cubicle wall to help you keep your balance. The body itself can be a great tool and also a hindrance to our own spiritual progression. Blockages and problems with our bodies can arise from not sitting correctly, being hunched over, or by eating the wrong types of foods. While the clean eating trend is here for the moment, it’s important to find your own beneficial “type” of eating. Fruits, vegetables and grains are a great source of essential vitamins and nutrients to help keep us powered through the day and more mentally prepared for the challenges that face us in an office environment. The physical challenges that we can experience include improper ergonomics in the workplace including wrist rests, ergonomically designed mice for computers and chairs with proper back support. If your organisation doesn’t already have an ergonomics check in place, consider spearheading the project and encourage your company to invest in proper supports for the physical body. They may be surprised to learn how it translates into effective and measurable productivity. Our souls are some of the most important aspects of being healthy and productive – not just in the office but in general. If we aren’t happy and content in our souls how can we effectively work in the modern world? By turning our cubicles at work into personalised spaces with our favourite things, inspirational quotes and more we can then effectively create a soulful and mindful work environment where we’re continually reminded of how much worth we have as human beings – both inside and outside the organisation. This also ties into our mind and mental wellbeing and through yoga and breathing techniques we can help create a space where we are continually emitting positive energy for the 8 hours plus that we’re in the office. So if you’ve been looking for a way to truly get in touch with yourself and create the perfect working environment that continues to generate health and wellness in our whole beings – body, mind and soul.